Sophie Alexander looks to send Collingwood further afield during its loss to Geelong in the VFL Women's Preliminary Final. Photo: Shane Barrie. Collingwood’s 2018 VFL Women’s season came to a close with a 14-point loss to Geelong in Sunday’s Elimination Final. The Magpies had their opportunities but struggled to convert throughout the match, conceding an early break to Geelong and never managing to fully make up ground. 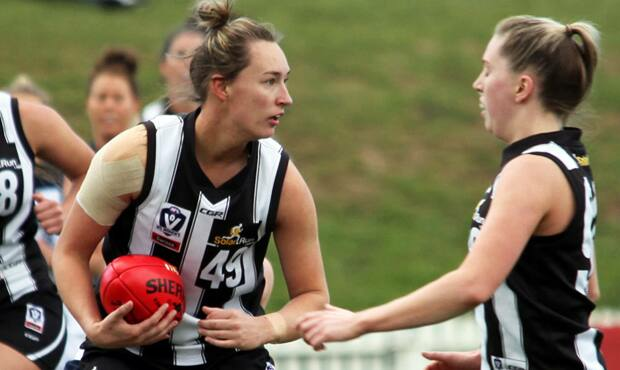 The loss was compounded by an injury to star Magpie Chloe Molloy, who limped off suffering a foot complaint that would see her remain on the sideline for the rest of the match. Although Geelong’s intensity and pressure was a standout, its inaccuracy in front of goal was its one flaw. The Cats, though, ultimately found a way in the third quarter through goals to Kate Darby and Maddie Boyd that took their lead to 27-points at the final change. Captain Jessica Edwards led Collingwood to a minor premiership in the club's first season in the VFL Women's competition. Photo: Shane Barrie. The Magpies gave their all in the last, with Stacey Livingstone, Jaimee Lambert and skipper Jessica Edwards combining for three consecutive goals. Unfortunately it wasn’t enough to cage the Cats, who will now meet Hawthorn in next week’s Grand Final. While the loss will sting, the Magpies have much to be proud of. Having been crowned minor premiers in their inaugural season, as well as reaching the Preliminary Final, the team has made a fine start under coach Penny Cula-Reid and will have plenty to take into their pre-season ahead of 2019.